Photo by Julieta Cervantes Dolly Gallagher Levi (Betty Buckley) dances with the Harmonia Gardens wait staff. Photo by Julietta Cervantes A scene of celebration plays out in Horace Vandergelder's hay and feed store. Photo by Julieta Cervantes Dolly (Betty Buckley) and Horace (Lewis J. Stadlen) enjoy a moment. Photo by Julieta Cervantes The Harmonia Gardens' wait staff dance. The woman of the moment rises. She approaches us with purpose, flashes a welcoming smile and waves warmly and enthusiastically to us. Perhaps the suddenly-skyrocketed wattage resulting from her warmth and brightness tempts us to silently hum the opening lyrics to the iconic title song. Of course, that number is “Hello, Dolly!,” from the beloved 1964 record-breaking musical phenomenon. And in a gorgeous equity touring production, almost immediately after the legendary Betty Buckley as Dolly starts speaking, one thing becomes clear: We will adore this Dolly. No doubt, she’s anything but a “damned exasperating woman,” regardless of what Horace Vandergelder says. To be sure, Buckley’s Dolly is confident and strong-willed. Still, she’s not arrogant. And while she declares herself a “meddler,” her mischievous meter tilts toward the lower end. In short, this indomitable person is the type of individual we’d want at our side. Certainly, when it comes to playing someone so three-dimensional, interpretations will differ. Indeed, each of the countless actresses who’ve portrayed her have emphasized one or more characteristics. 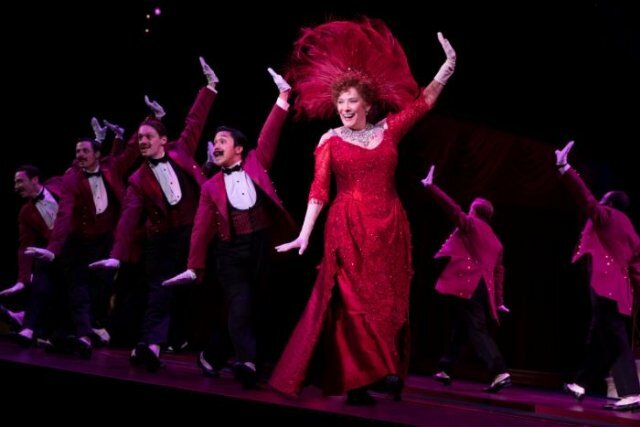 With that said, a refreshing gentleness, positive vibe, modesty and charm predominantly radiate from Buckley in the national tour of the most recent Tony-winning revival of Hello, Dolly! In this mounting, you get the sense that Buckley’s Dolly can handle any situation. Furthermore, she can do so with dignity, grace, compassion and composure. For example, as Lewis J. Stadlen embodies Horace Vandergelder, he loudly and exasperatingly denounces Dolly. No problem; she merely kills him with kindness. This creates contrast, tension and a compelling battle-of-wills — even though the show’s fans know the story’s ending. Surely, the two leads’ spontaneity helps immensely. In particular, a red-faced, mustached, scratchy-voiced Stadlen, a prolific Broadway veteran, maintains his stubborn, proud demeanor until the end. Also, to his credit, Stadlen doesn’t make Vandergelder totally unlikable. Sure, he’s ornery and loud — think Ralph Kramden in The Honeymooners or Lou Costello in Who’s on First. Even so, Stadlen finds charm and charisma within the character. Buckley also delivers a multi-faceted performance. Dolly’s vocations are many. She offers others many services. In fact, one of the joys and comforts of watching this production is noticing how, suddenly and without fanfare, this incredible Jill-of-all-trades holds out a business card for a character in need of help. However, Dolly’s merely flesh and blood, and Buckley skillfully conveys her character’s humanity. This is particularly true when she’s “talking” to her deceased husband. She “asks” him to allow her to move on. After all, life is for the living. Dolly expresses this through Herman’s metaphoric lyrics in “Before the Parade Passes By.” The song begins slowly and with a contemplative air. Then the tempo picks up. Not long after, the number becomes one of the production’s most spirited, up-tempo songs. We see and hear a joyful woman with a renewed zest for life, marching with the vivacious parade participants. Buckley wraps her honeyed, versatile voice around Herman’s simple, yet heartfelt lyrics. She dances energetically at times, and graceful at others. For instance, this beloved performer sways and happily basks in the love she receives at the Harmonia Gardens during the tender title song. Buckley is resplendent in a red outfit. She also sports jewelry as sparkling as her personality and a tall, feather hat. For sure, Dolly is the main character who drives this story. But some people might only be familiar with her and the title song, simply because the show is so steeped in culture. Fortunately, Buckley doesn’t let Dolly dominate. As a result, we can more easily enjoy and notice, for instance, a showy Vandergelder in the Act II opening number, “Penny in My Pocket.” It’s a tour-de-force rendition. Other standouts include an adventurous, spirited and spunky Analisa Leaming as Irene Molloy. She’s a milliner who’s restless and aching for a life outside her dress shop. Also, Nic Rouleau and Jess LeProtto, as Cornelius Hackl and Barnaby Tucker, respectively, invest their characters with wide-eyed, eager, unsophisticated but lovable personalities. On the other hand, Morgan Kirner, in the role of the whiny Ermengarde, overacts, even by musical comedy standards. But overall, this cast nails comic timing, especially during the farcical scene inside the dress shop. In addition to their acting prowess, cast members sing and dance with vigor. A live, vibrant, but not overpowering orchestra accompanies. But let’s not forget the “behind the scenes” theater artists, who are just as integral to this production’s rousing success. They include director Jerry Zaks. He stresses the comic aspects of the musical, but lends equal weight to the dramatic material. Zaks also creates striking stage pictures. Meanwhile, choreographer Warren Carlyle’s lively and creative movement injects energy into the production and reinforces mood and emotion. Ditto for Natasha Katz’s lighting design. Scenic/costume designer Santo Loquasto’s excellent work includes eye-popping character- and period-appropriate outfits. Also, his depiction of The Harmonia Gardens restaurant is elegant and stylish, with red the predominant color. By contrast, the busy, cluttered look of Vandergelder’s Hey and Feed store suggests he could use an assistant as efficient and talented as Dolly. 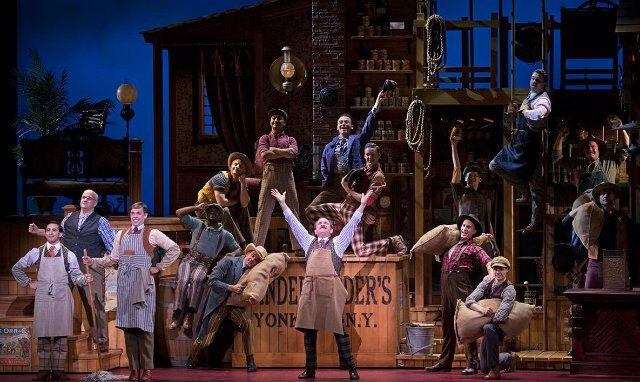 Sometimes, the colorful sets, painted backdrops and costumes evoke a sense of pure Americana. They might bring to mind The Music Man. 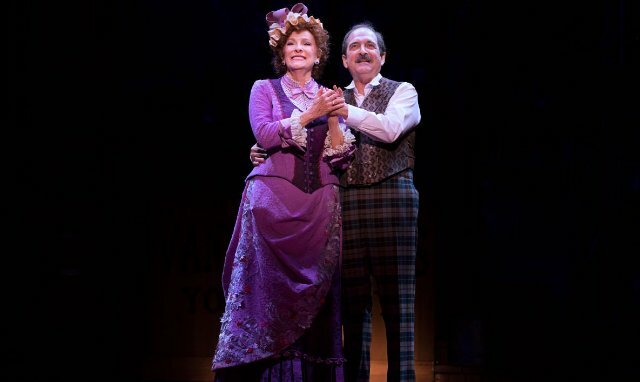 Some may wonder whether Hello, Dolly!, like the aforementioned Meredith Willson musical, is merely a period piece. But Dolly isn’t only a turn-of-the-century show about a matchmaker. It’s about strong female characters taking the initiative to make things happen. Putting such characters on stage is a healthy practice for live theater — especially during a time when many are advocating for more strong female roles. But women taking charge also reflects modern times, with the MeToo movement seeking to empower them. During the parade scene, such advocacy is event — some marchers hold suffragette signs. So yes, Hello, Dolly! is pertinent to today. Moreover, Dolly is unquestionably as much a coveted role as Lady Macbeth and Hamlet. Fortunately – for us and her – Buckley landed this role. And she’s shining as Jill-of-all-trades Dolly Gallagher Levi. 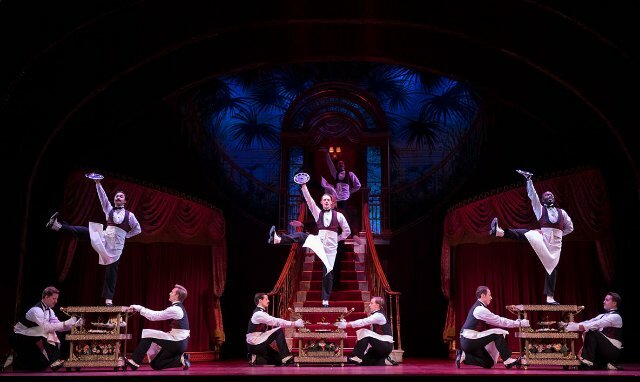 The equity national touring production of the recent Broadway revival of Hello, Dolly! may soon come to your city, or one near you. For ticket, time and venue information, visit http://hellodollyonbroadway.com/tour.